A correct fuel and air ratio must be maintained for optimum performance, economy and emission requirements. This balance is monitored by oxygen sensors in the exhaust system which provides feedback information to the car's computer (PCM-ECM). The computer then makes adjustments in real time to the fuel being added at any given RPM or load demand. When parts of the sensing or fuel delivery system malfunctions it can produce black smoke from the exhaust pipe. This can vary due to several aspects which depend on the problem itself. In some cases most of the expense can be tracking down the problem, for example: A car has black smoke and no trouble codes present in the computer. All mechanical items are checked and deemed okay its not until the PCM grounds are checked and found to have high resistance which is an easy fix. Finding the problem is most of the cost while the fix was quite simple. MAF or MAP sensor out of calibration. EVAP charcoal canister letting raw fuel into the vacuum supply line. Melted engine coolant temperature sensor. Black smoke means increased exhaust temperature and particulates. This can have a negative effect on particular parts of the exhaust system such as the catalytic converter. Over possessing fuel will cause the catalytic converter to overheat and break apart clogging the exit port. This can also have a result on the muffler system again vastly restricting the exit performance of exhaust gases (engine). Excess carbon build up can cause the EGR valve to stick open allowing intake pressures to drop and the engine to stall at idle and run rough. Burning to much fuel will cause the spark plug to carbon foul causing the engine to stop running. Once the issue has been rectified the old spark plugs must be removed and new ones installed. Oxygen sensors also or subject to heavy particulates which can hinder their ability to differentiate atmosphere causing poor performance issues. 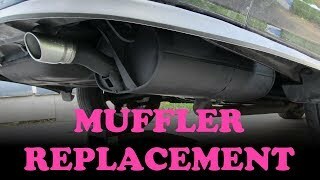 Carbon can also build up on the outside of the exhaust tip causing a cosmetic problem. Weather the Check Engine Light (MIL) is on or not it's a good idea to scan the computer for trouble codes. These codes help us determine the system the code pertains too and is having trouble. For example: P0101 (Mass or Volume Air Flow Circuit Low Input) telling us there is an issue with the MAF electrical connection. P0116 (Engine Coolant Temperature Circuit Range/Performance) letting us now the coolant sensor is shorted out causing the fuel system to go full rich. Excessive fuel pressure will push extra fuel past the fuel injector even if the computer has shorted the pintle valve duration. All fuel systems have a regulator weather internal to the fuel pump or external at the fuel rail. In either case checking the fuel pressure can help us find a bad pressure regulator. If the pressure regulator is external remove the vacuum line to check for raw fuel. If present this indicates a bad diaphragm in the regulator requiring replacement. When the coil windings inside a fuel injector fatigue they can contact each other causing low resistance. The injector driver inside the PCM responds to this condition with an extended duty cycle or a direct close of the driver causing the injector or group of injectors to dump fuel inside the engine. By removing each cylinder spark plug and checking their condition (black or wet with fuel) you can identify the afflicted cylinders. Once completed remove the injector(s) for a physical and ohms test across the coil. Remove the EGR to check valve operation. When this valve is not in operation it should remain closed. If the valve is stuck open it will drop intake manifold pressure signaling the computer the engine is under load even when it's not. This will cause the computer to inject more fuel into the engine creating black smoke. A sealed intake system is essential for the computer to determine what the engine is going through ie: under load or coasting downhill. If there is a vacuum leak somewhere in the system this value can be misinterpreted by the MAF or MAP sensors. Computer systems require a good power source and clean ground to properly operate, in particular the injector drivers. These drivers rapidly open and close the injector which controls the amount of fuel entering the engine. If the ground has high resistance it will affect the injector duration allowing excess fuel to enter the combustion chamber. Our mechanics are standing by ready to help.